https://northernkentucky.bintheredumpthatusa.com/article/5-tricks-to-delcutter-your-closet	Bin There Dump That Northern Kentucky	https://northernkentucky.bintheredumpthatusa.com/img/franchisees/86.jpg	, Covington, KY	Contact us for more details. Keeping a closet organized is challenging, at the best of times. Most of us have more clothing and accessories than we know what to do with and not enough space to store everything. When clothes and accessories start piling up, a closet quickly becomes disorganized and cluttered. After a while, it becomes next to impossible to find that favorite pair of socks or those nice looking jeans. Plus, how on earth did that purse end up in your closet when it was supposed to be hung up near your entryway?! The good news is even if your closet is too small (or you have too much stuff) for your growing wardrobe, there are still many solutions you can implement to keep it organized. Help is on the way! 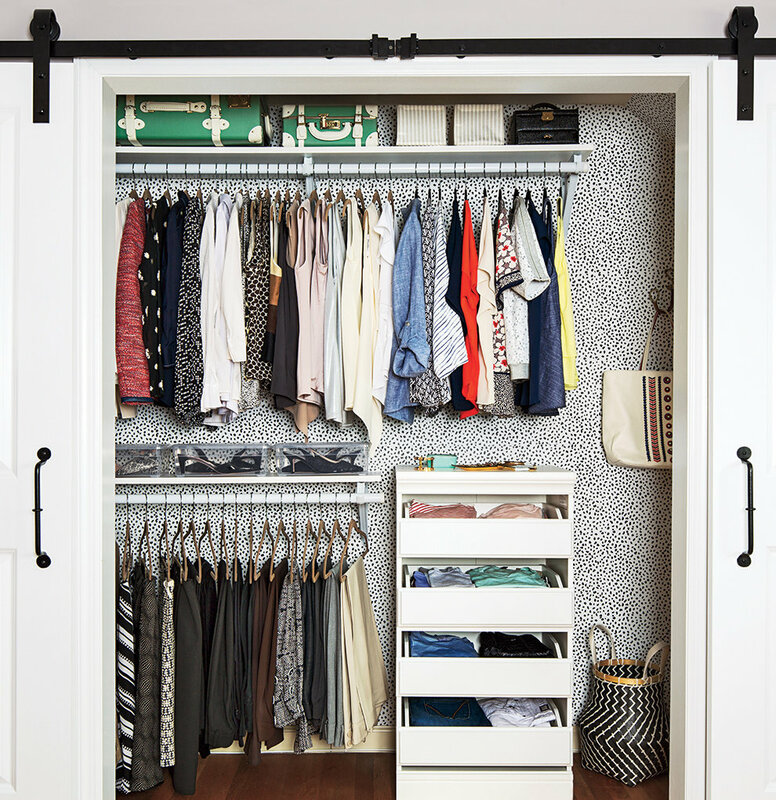 Below are some tips on how to get your closet (and sanity) back. People too often think that storage containers are the key to organization. While the sentiment carries weight, it often doesn’t work out that way. The problem is that people use storage containers and boxes and to hide a mess as opposed to getting rid of a mess. To address this issue, we suggest a serious audit of your storage containers. Every season, go through your boxes and dispose of things you don’t need or want. The goal is to get rid of as much stuff as possible in order to (eventually) get rid of the containers altogether. This may sound obvious, but a shoe organizer can really help you get organized. There are plenty of over-the-door shoe organizers that you can pick up for pretty cheap. Using a shoe organizer will clear up your floor and provide you with new closet space that you can utilize by adding functional shelving and other organizational tools. If you don’t have a closet door, you can purchase a hanging shoe organizer instead. A hanging shoe organizer hangs from your closet bar similar to other hangers. Typically they have fewer slots for shoes, but they’re still a better option than having your shoes scattered all over the floor in your closet. If you also store your socks and underwear in your closet, depending on how messy your closet is, you may or may not be able to locate them. If you can’t find them, as you organize other items hopefully they’ll show up. If you do know where they’re at there are still ways to improve how you are currently storing them. For starters, as opposed to folding them or laying them flat (which is even worse), a better idea is to roll them up, so they occupy the least amount of space. In fact, this is a common practice in the military when people have less space to store their clothing. Take the time to learn how to fold your underwear and socks military style. After you master the technique, it’s time to ditch that old sock basket or drawer. Replace it with a smaller one and implement your new military-style folding skills! One of the biggest reasons for a messy closet is having too many off-season clothes. If your puffy North Face jacket is hanging in your wardrobe during the middle of summer, it’s going to be more challenging to add more tank tops. The best solution for organizing your space and making room for the current season’s clothing is storing the clothing you’re not wearing under the bed or in another room. You don’t need it in your closet taking up more space. However, if you don’t have a lot of extra space, you should consider vacuum sealing your off-season wardrobe. Compressing your off-season clothing will take up less space in your home as opposed to barely squeezing it into your small entryway closet. Vacuum sealers are reasonably inexpensive, and they’re also a fantastic tool for anyone who needs help organizing. Many people have messy closets because they don’t have enough time to put their clothing and accessories back in their proper spot. An example is taking out several outfits and laying them on the bed so you can decide on what to wear for work that day. As opposed to hanging up the outfits that didn’t win, you haphazardly toss them on the floor in your closet. If that sounds anything like you, it seems like you could benefit from organizing your clothing by color or style. There’s something incredible about a nicely curated closet. It’ll hopefully motivate you to put things back where they belong. Think about it: If you have a section of blue clothing in your closet and you put the blue item back where the black tops are it’s going to bug you. If your closet is nicely curated and organized by color, you’ll be less likely to hang up a blue top in the black section. Curating and organizing your closet by color does take more effort, but in the long run, you will be satisfied with the results. Not only will you feel accomplished, but you’ll probably want to keep everything organized because otherwise, you’ll be undoing all of your hard work. When everything is said and done, it’ll feel incredible having an organized space. Even if your closet looks like a monster right now, that doesn’t mean it has to stay that way. Try implementing some of these tips and think of other ways to organize your space - you’ll be amazed after your closet gets transformed and organized! Now it’s time to continue organizing. Start by putting all of those newfound organization skills to use in other parts of your home! Carolina Creek is a great townhouse-style community located about a mile from Eastern Carolina University's campus. The community consists of 2x3 and 3x3 apartments and contains a full amenity suite including a fitness center, pool, business center, and game room. The community is the best value in the Greenville NC student housing market.